In our real applications we have to convert from strings to integer or to real variables and vice versa (double/float/int variable to std::string). We can realize these conversions using C style CRT function or we can try C++ approach via STL. In this case we can use c_str() in order to return a constant pointer to char. An elegant way to get rid of such problems is to build two conversion function that use templates and C++ streams. Base on this idea, I created a Sting2Numeric class that contains two static methods: Type2String() and String2Type(). where BadConvertion is a std::runtime_error‘s derived class. Because of this compatibility I strongly recommend using a xstring alias instead of std::wstring or std::string. When you want to convert an int, float, double, or other numerical type to a xstring in a C++ style you can use the Type2String() function. Vice versa, if you want to convert a xstring to these types you can use String2Type(). In order to avoid possible thrown exception I recommend to you using a try catch block whenever you’re using these functions. I prefer using xstring for string/wstring variables definition, too. The String2Numeric class can be extended. For instance, if the conversion throw an error then you can add detailed information in the exception message. Download String2Numeric	(985 downloads) class. Manually editing of binary files version in the resource editor of Visual Studio IDE is not a viable solution. If we have dozens of projects in our solution, then for each kit building we should need manual resources file edit. Otherwise, we can use a special tool that does this thing for us. Unfortunately this approach is not the most flexible and could fail. For our flexible binaries properties changes and in order to avoid manual edit for each rebuild we can create and include a header file (version.h) that contains some constants of product version and file version of our project (.rc files). #define PRODUCT_VERSION 4.3.2.198 #define PRODUCT_VERSION_STR "4.3.2.198"
Then, for each .rc file wherever we have FileVersion and ProductVersion we have to use this constants. When we will build a new kit, we have to change only these constants and then to start the kit building process. Everything is fine until we add new controls in our projects resource files. Then, because of Visual Studio IDE automation we can get an unlikely surprise: the FileVersion and the ProductVersion properties could be reset to 1.0.0.0. Create a version.h header file that have to contain these constants only (as on top). I should recommend to create it into the root solution in order of being easy included in all the projects. Include this file in the project you need to use. Use a text editor (ex. notepad.exe) and include next code section at the end of .rc2 resource file of your project (res\your_project.rc2) – this section contains the include version.h file section, too. VALUE "CompanyName", "TODO: <Company name>"
VALUE "FileDescription", "TODO: <File description>"
VALUE "LegalCopyright", "TODO: (c) <Company name>. All rights reserved." 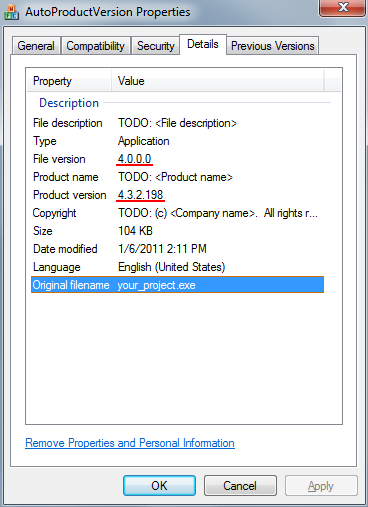 VALUE "ProductName", "TODO: <Product name>"
Edit “040904e4” block code with same data as if we should edit in a resources editor and use the version.h‘s file defined constants. As you can see in my example, for the FileVersion and ProductVersion properties I use my version.h constants. These properties will not be edited anymore. Delete “// Version” section from default resource file your_project.rc (including comments – recommended). "#include ""res\\your_project.rc2"" // non-Microsoft Visual C++ edited resources\r\n"
"#include ""afxres.rc"" // Standard components\r\n"
Don’t forget to edit .rc2 file name with the right file name of your project. The rest of the section’s lines have to be deleted. We save both resources files: your_project.rc and your_project.rc2. Rebuild the project and check the new generated binary properties. In the FileVersion we will have the major version (in my case 4.0.0.0) and in ProductVersion we have the current build version (4.3.2.198). Once you apply these steps, the product version properties will not possible from the Visual Studio IDE resource editor, anymore (only as edit text file or an external text editor). If we didn’t define something special in our project’s String Table we will see only IDS_ABOUTBOX.